Engineered or Solid Wood Flooring – Which is better? Engineered or Solid wood flooring is by far one of the most common questions we receive, but by no means does that make it a bad one. It can be a confusing topic if you’re a first-time buyer, especially as many approach the subject with a preconceived notion that Engineered wood flooring is a subpar type of laminate; which it certainly is not. On the contrary, it is regarded by many as the best or even obvious option, but that does not mean Solid wood flooring is without merit. In this article, we hope to clear up this topic once and for all. Before we compare the pros and cons of the different systems, it’s important to first understand the method in which they are made. As the name suggests, Solid wood flooring is made up of nothing other than your chosen species (we’ll use Oak as an example going forward). So if you are looking to purchase a 20mm thick Solid floor, you are getting 20mm of Oak and nothing else. Engineered wood flooring is mostly constructed with multiple layers of plywood. The techniques, materials and number of layers differ between manufacturers, but in principle, they are all the same. The ply layers are glued together with the grains running in opposing directions (we’ll learn why this is important later). The boards are then finished with an Oak top layer or ‘lamella’. 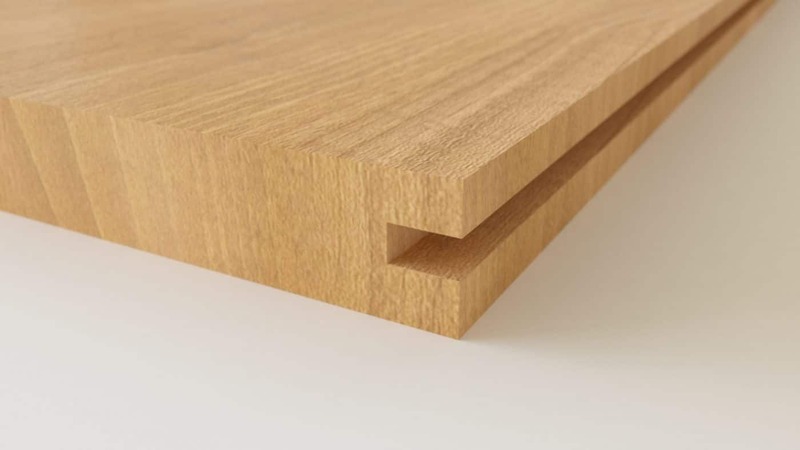 Thus a 20mm engineered board may actually have an Oak lamella ‘only’ 5mm thick. This is where people usually misjudge Engineered flooring. Most focus on the fact that 75% of the board is not Oak and seem to forget that in reality, once it’s fitted you would never know the difference as the most important top layer is. With all the additional manufacturing processes used to make engineered wood flooring, you may now be thinking that it’s surely more expensive. 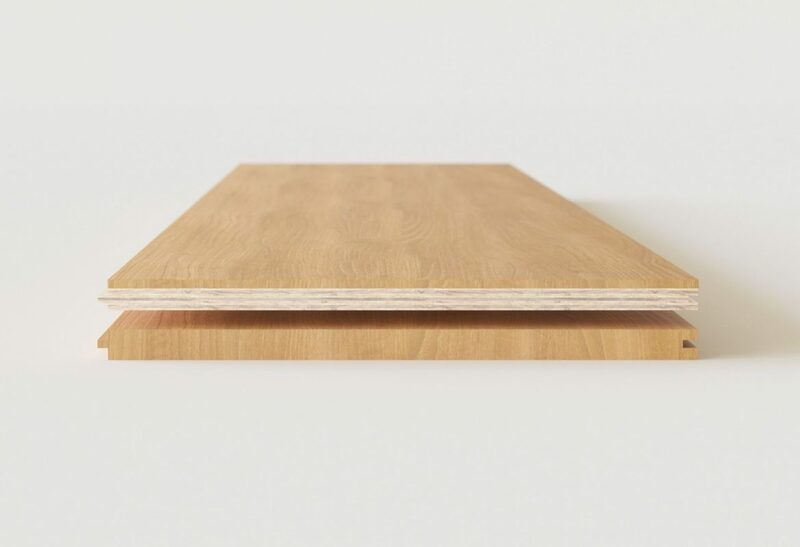 Actually, Engineered wood flooring is usually much cheaper than solid wood flooring for the simple fact that ply costs considerably less than Oak. But the advantages don’t stop there. A persistent problem with having wood flooring is that it absorbs moisture. This happens because wood is made up of millions of tiny hygroscopic cells which gives the planks properties not too dissimilar to rice. As temperature and humidity levels fluctuate the boards expand and contract which can open unsightly gaps between the planks. If two boards are pushed together they can even lift up or create an effect known as ‘cupping’ where the plank curls into a U shape. The same is true of Engineered flooring, but because of its construction, it has far greater dimensional stability so almost never encounters these problems to the same degree. The reason being is that while still affected by the moisture, the crisscrossing plywood layers are battling to go in opposing directions. The resulting tug of war is so evenly matched, there is little to no movement. 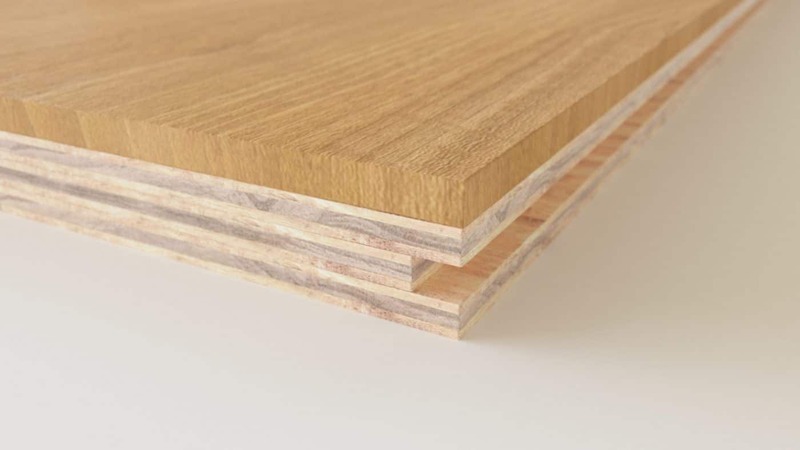 Thanks to this stability, Engineered wood flooring can safely be fitted in moisture high areas such as Bathrooms and Kitchens or even with Underfloor heating despite the ever-changing conditions that it creates. Another benefit to having such a stable platform is that manufacturers are able to produce larger planks. You’d be hard pushed to find a Solid board any wider than 190mm, but with Engineered this can easily exceed 300mm. It’s also possible to get lengths of over five metres. So, Why would you ever buy Solid Over engineered? Despite all the downsides associated with Solid wood flooring, it does have its advantages. First and foremost, if unaffected by moisture, its longevity can potentially be much greater than engineered. While you can only safely sand the top layer of engineered wood flooring twice or maybe three times during its lifetime, solid can be sanded twice as much if not more. This means when the floor starts to look tired and worn out, it can be sanded and refinished to look brand new again. In fact, it’s not unrealistic to expect a well maintained Solid wood floor to last over a century. Another advantage that tends to be overlooked by many, is that sometimes the imperfect surface a Solid wood floor can provide, may be exactly what a room needs. A rustic style floor with deliberate scrapes and deep knots would benefit from crooked joins and an undulating surface. 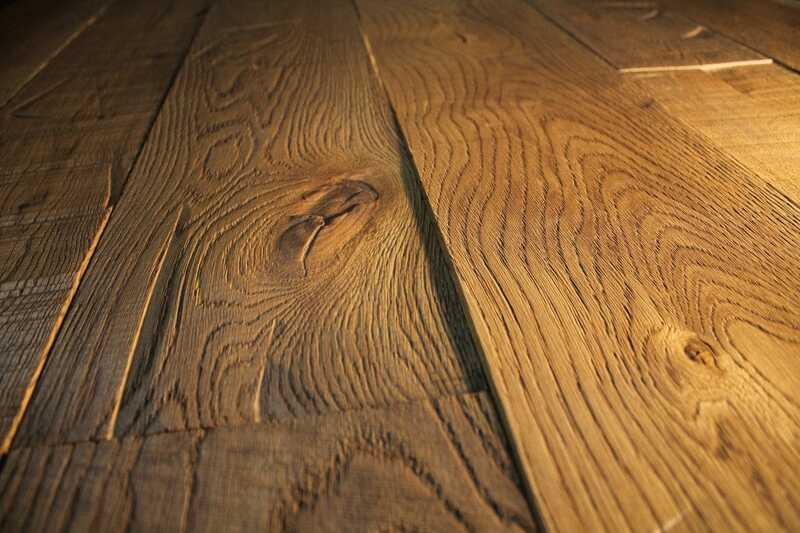 For example, The Oakwoods Framlingham Aged Floor pictured below. Such effects on an Engineered floor would only reveal the plywood sublayers beneath. Solid wood flooring certainly has its place in today’s market. The additional design freedom it provides – especially with respect to ageing techniques – is unrivalled. It has been a popular flooring for decades and if used correctly, will continue to be so for years to come. That being said, it’s hard to ignore the versatility and dimensional stability Engineered wood flooring offers. It can be used in situations where traditional Solid wood flooring would fail such as bathrooms and kitchens. With the price difference in its favour as well it is the obvious choice for most buyers. On top of this, with Engineered’s growing market share, there are a plethora of colour and style options out there. While Engineered cannot be sanded as much as Solid, today’s maintenance products are so advanced, this point is moot. A properly maintained and regularly serviced Engineered floor can easily last several decades without any sanding. We hope this article helped you reach a decision, but if you still have questions please do not hesitate to contact us. Safe To Fit In Kitchens? Some Ageing Techniques Not Possible? Cannot Be Sanded As Much As Solid?